I might be the only Christmas-celebrating food blogger out there who hasn’t been bombarding her readers with cookie recipes, ideas for edible gifts, and seasonal treats for the last few weeks. I don’t know; I just wasn’t feeling the baking bug yet. 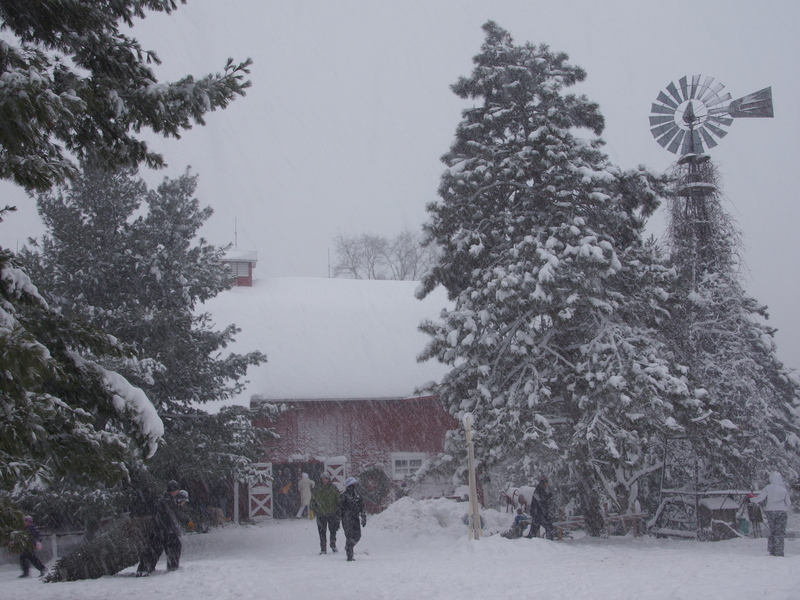 Then on Sunday, Matt and I drove a hundred miles over (two) rivers and through the woods arriving at a terribly charming Christmas tree farm. 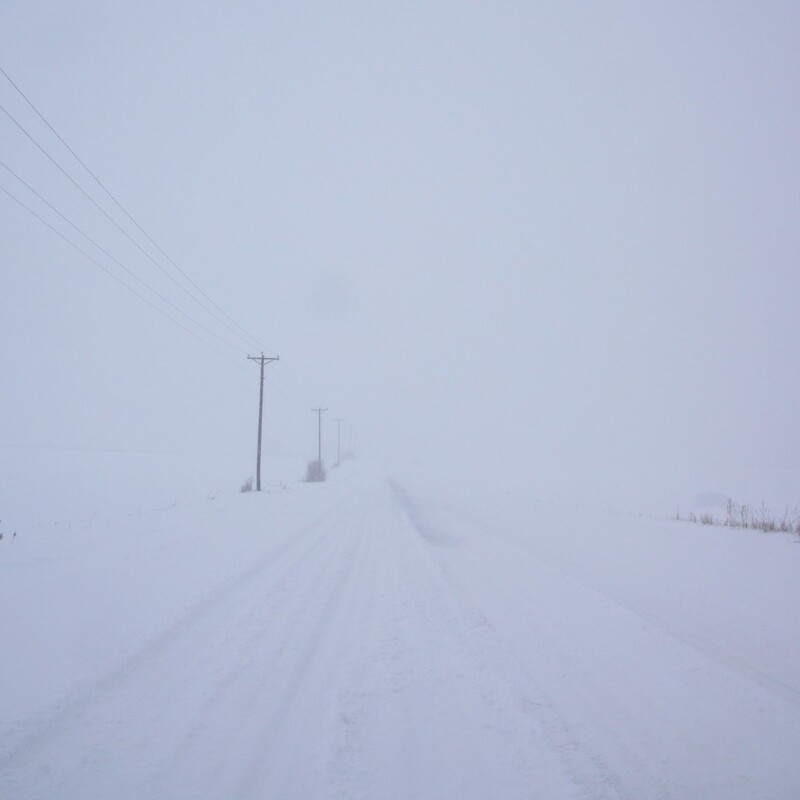 I should add that we were traveling in near white-out conditions through a real-life winter wonderland, while rockin’ out to some holiday tune-age. Suddenly, I was feeling it. 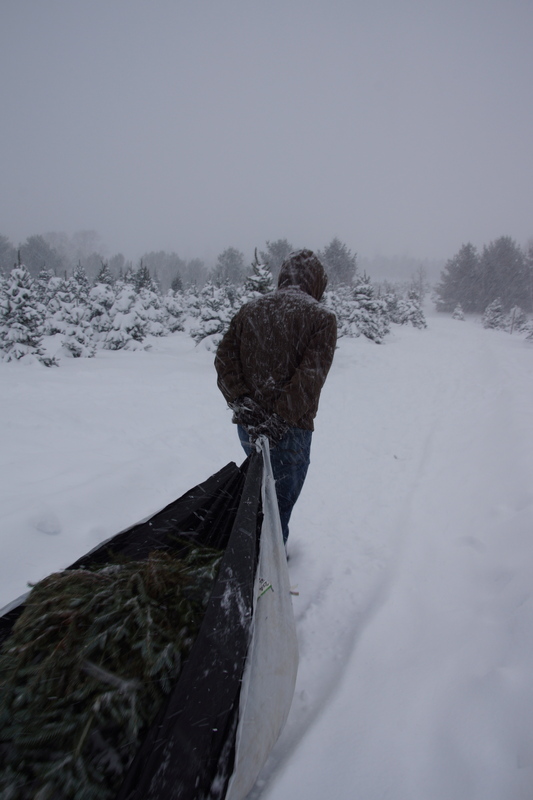 You can’t have a day of near-death driving that results in a Christmas tree and a tangle of twinkle lights in the middle of your living room without wanting a little cookie to nibble. We’d better get down to business. 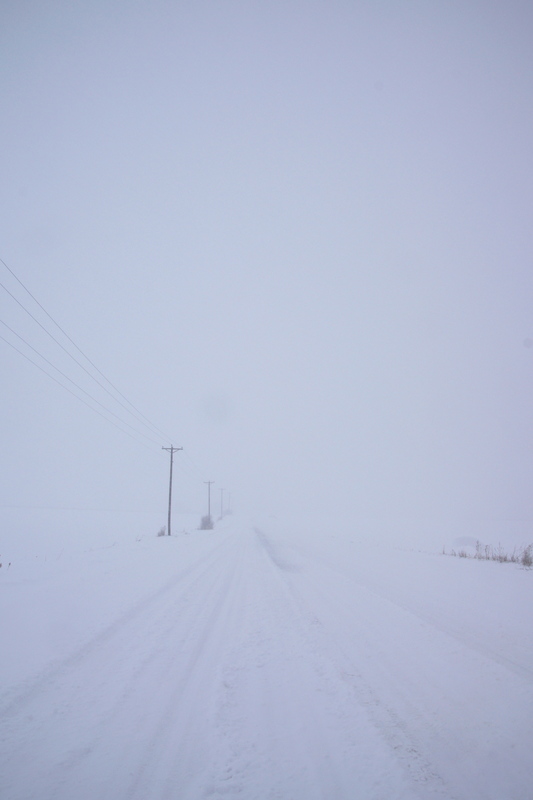 In other words, if you want to play along with my blog for the next couple weeks, you’d best be making a batch too! 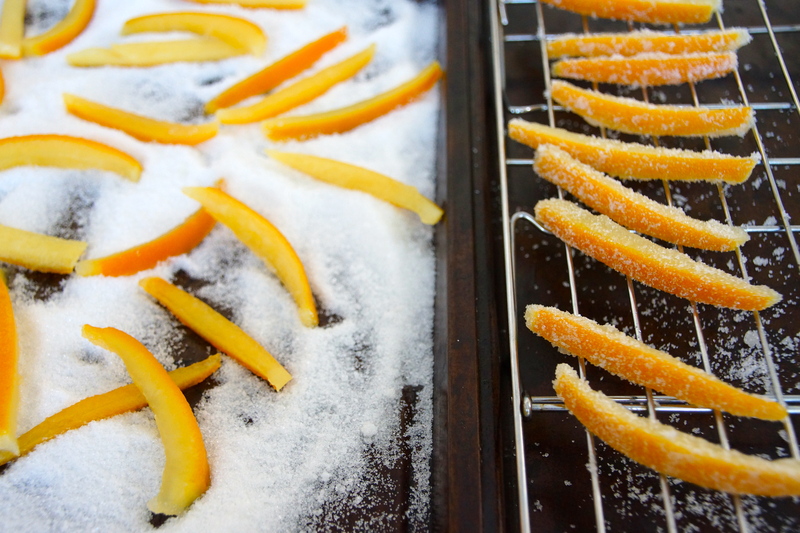 You can probably buy candied orange peel, but it’s awfully easy to make at home. Watch, I’ll show you how to do it. Cut off the top and bottom of a couple oranges. Score the skin in quarters, vertically. 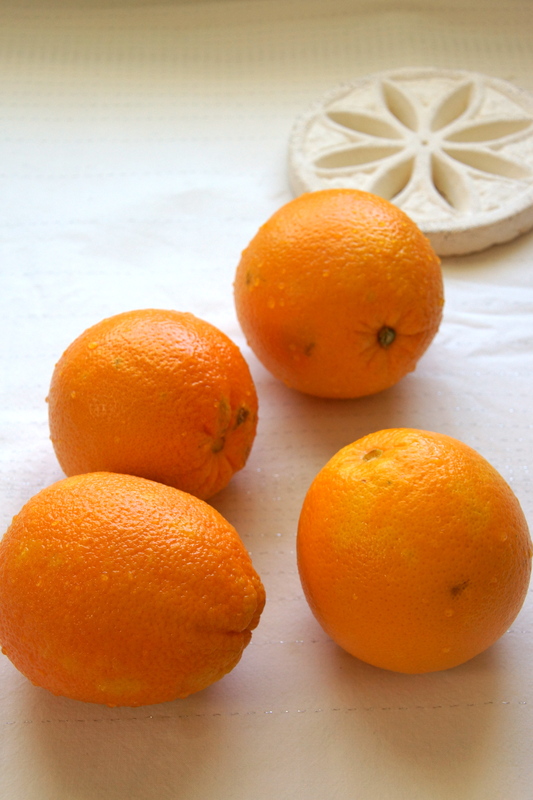 Remove skin, keeping peel and pith intact. 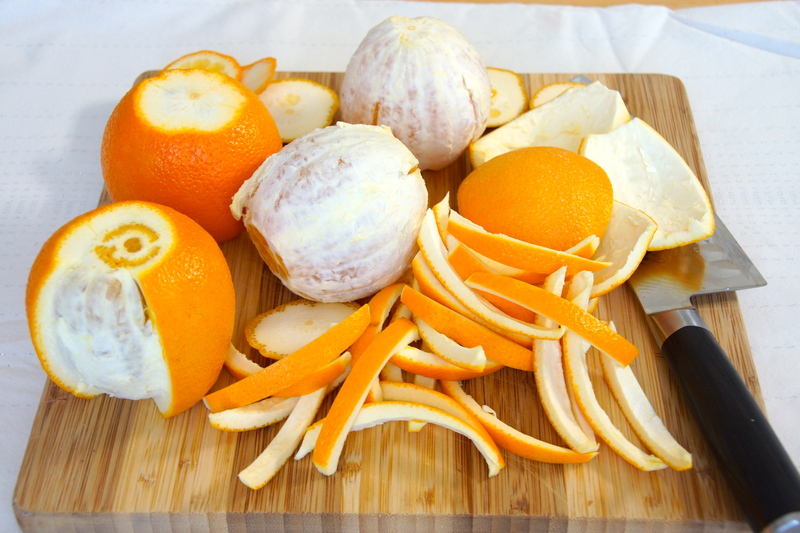 After you’ve removed the peels from all your oranges, slice each section into 1/4 inch strips. The orange peels get twice-boiled. Round 1: Boil in water to remove bitterness. Round 2: Boil in simple syrup to sweeten and delish-en. By the way, if you’re feeling funky, you could certainly drop a couple of cinnamon sticks, cloves, a sprig of rosemary, or a hunk of ginger in the pot at this point. How do I know this would be tasty? Well, you’ll just have to check back later this week to find out. 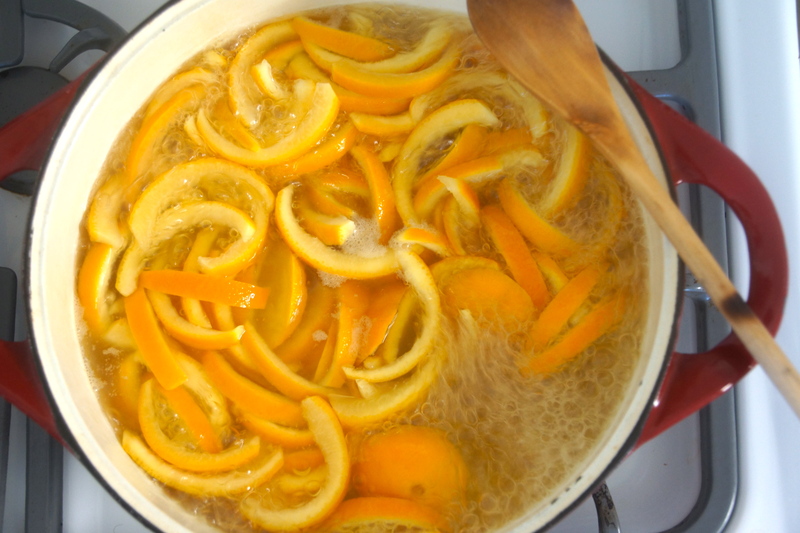 Let the orange peels simmer in their sugar bath for 45 minutes or so until they are soft and sweet. Drain. Don’t toss the syrup; reward yourself for all your hard work with a cranberry-orange spritzer or stir it into a cup of Earl Grey. Spread some sugar on a sheet pan and roll the pieces of orange peel around, coating evenly. Shake them off and place them on a rack to dry out for a day or speed things up by tossing the rack into a warm oven for half an hour. And that’s it- homemade candied orange peel. Check it off the list, let holiday baking commence, and bring on the Christmas cheer. We’re ready now. 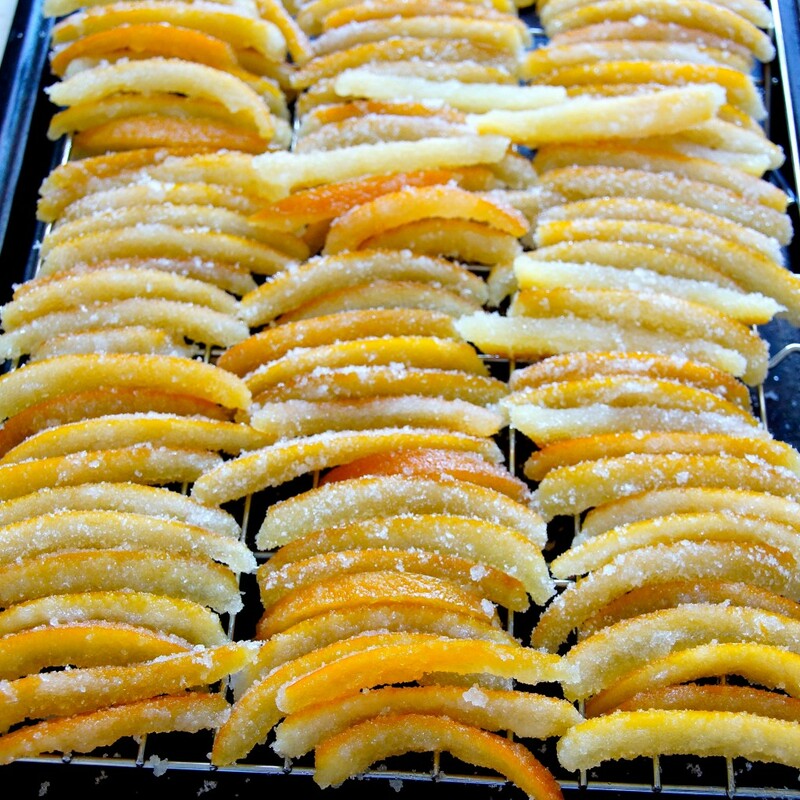 These candied orange peels can be eaten as is, dipped in dark chocolate, or added to other baked goods. Meanwhile, cut tops and bottoms off each orange. Score the skin of each orange in quarters. 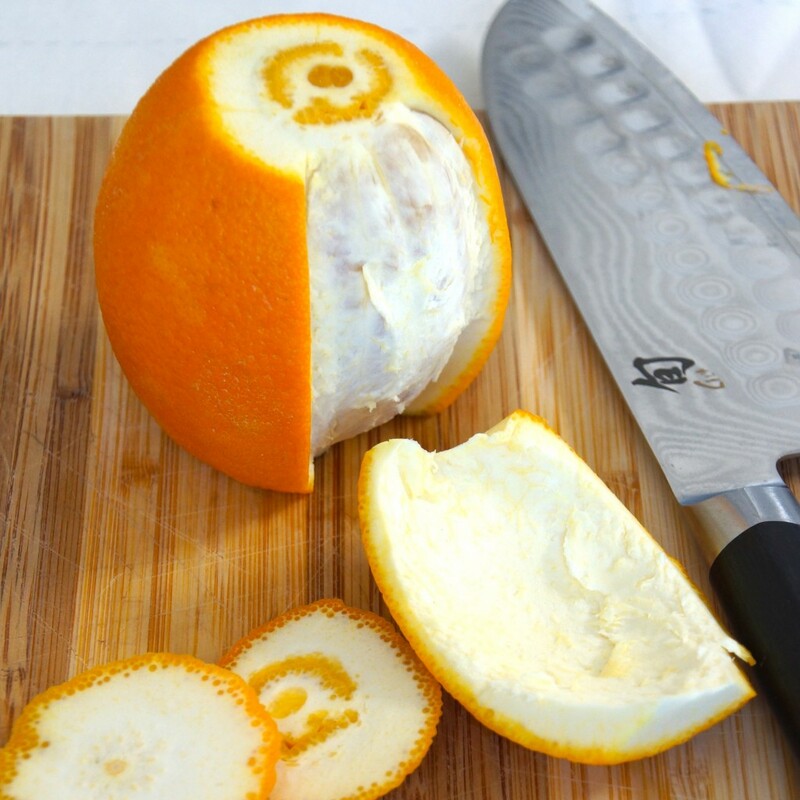 Remove peel, keeping pith intact. 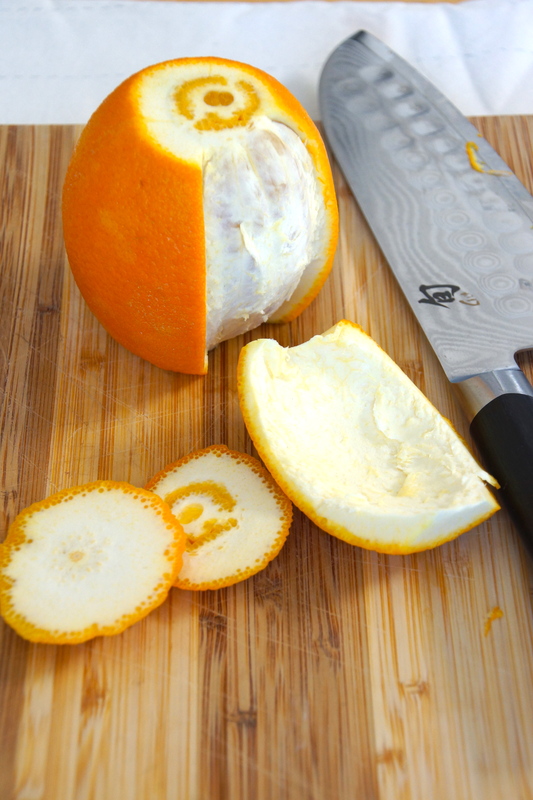 Slice peels lengthwise into ¼ inch strips. 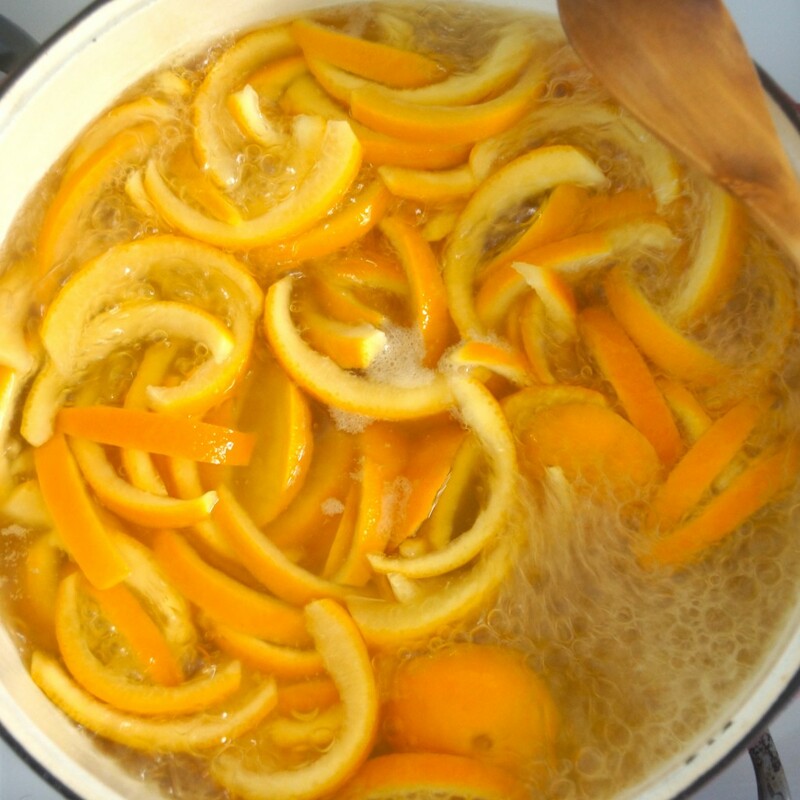 Place strips of orange peel in boiling water and boil 15 minutes. 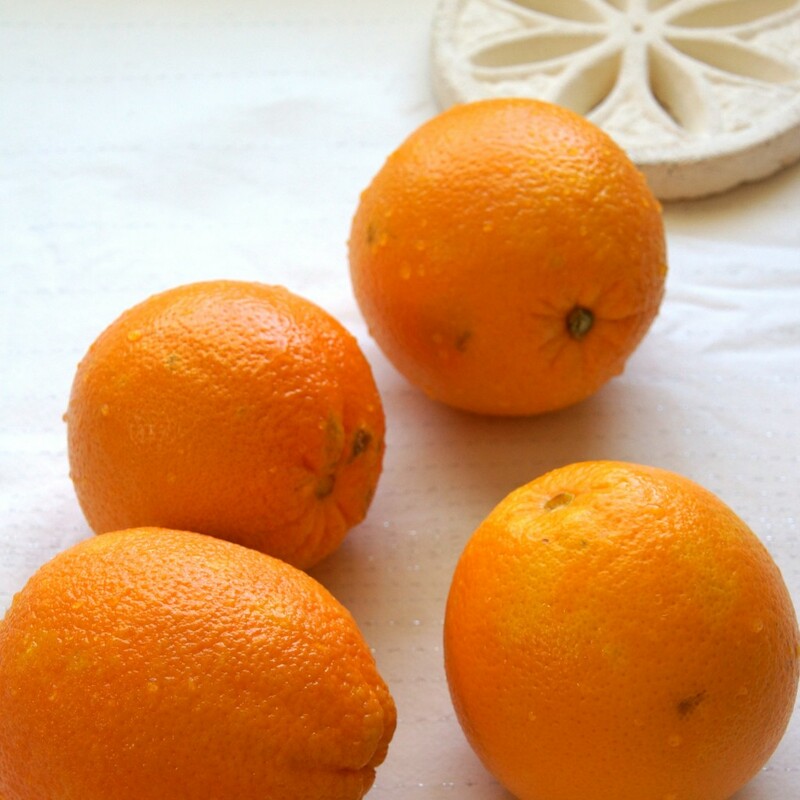 Drain and rinse orange peel. Combine 3 c. sugar with 3 c. water in saucepan. Bring to boil over medium heat, stirring to dissolve the sugar. Add the orange peel to the boiling liquid, reduce heat, and simmer until the peel is soft, about 45 minutes. Drain. Reserve liquid for future use, if desired. Spread remaining cup of sugar on a baking sheet. Roll the pieces of orange peel around, lightly coating with sugar. Shake off excess sugar and place on a baking rack to dry overnight. I make old English plum pudding cakes for friends at Christmas and start early because they need to be aged. So far this year I have not been able to find citron or candied orange peel so I am really excited about trying your recipe. I will let you know how it turns out! Thanks.